If you notice small balding patches in the corners and at the edges of your carpets and what looks like grains of white rice, the chances are that you have an infestation of carpet moths. This is a problem that needs immediate attention because it will continue to get worse. A mated female carpet moth can lay around 200 eggs in her short adult life and an infestation can very quickly get out of hand. Carpet moths are stubborn when it comes to leaving your home! 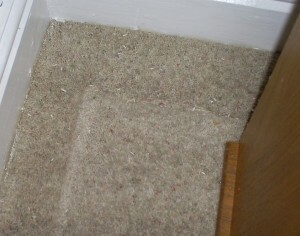 Damaged Carpet in dark corner of Customers lounge, picture shows where the wool fibres have been eaten by the larva of the carpet moth. Carpet Moths originally lived out in the country, usually in the nests of birds and other animals. They feed on the protein fibres, which are naturally discarded by their hosts, and choose to live in animal habitats for this reason. They also benefit from the warmth of the animal and prefer dark areas. In almost every case there is also a source of water in close proximity, be it a pond, river or lake. So it can be presumed that humidity also has a part to play in the life of a carpet moth and their reasons for settling in certain areas. Once inside your home, a moth will look for a hiding place where it would be safe to lay its eggs. Carpet moths inhabit less disturbed, darker & humid areas – behind sofas, along skirting boards, under cabinets or bookcases are typical hiding places for carpet moth larvae. 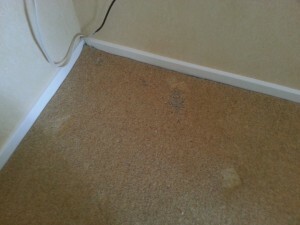 Regular vacuuming in these areas, moving furniture and opening curtains in lesser-used rooms will all help to create a less desirable environment for carpet moths to settle and cause subsequent expensive damage. The only interest in carpeting for a carpet moth is the protein value of the natural fibres. Just think, a room of twenty square meters of wool carpet would be heaven for them, providing a plentiful land to live, reproduce and spread for generations to come. As soon as an egg has hatched the larva will start feeding on carpet fibres. This stage usually lasts between sixty eight to eighty seven days. Tinea Pellionella (linneaus), often referred to as a Casemaking Moth, even spin a protective case that incorporates pieces of the item it is eating around itself. These cases are dragged around with the larva as they move and eventually become the cocoon in which they pupate and develop into adult moths. The pupation stage can last between nine and nineteen days and hatches an adult moth that will begin the cycle over again. Adult moths prefer to scurry along rather than use their wings. This is probably due to their habitat and not the fact that they do not need to leave the area to survive. The adults do not live long and the mated adult female lays hundreds of eggs in her short life time. The eggs will be laid in the quieter, darker and undisturbed areas of carpets and rugs and lay dormant for approximately 4 to 10 days before hatching. The larvae can live for up to 2 years which accounts for continued damage as they eat through the winter months, but in warmer periods they will pupate within 2 months of hatching, resulting in a number of cycles through the Spring to Autumn months. The pupation stage will last up to 2 weeks before the adults emerge. The adults are relatively harmless and only live 2-3 months, but the issue and risk to property is clearly the risk of further egg laying and the infestation getting out of hand, hence the need to deal with both adult and larvae stages of the carpet moth lifecycle in treatment routines. One of the possible reasons we are seeing more of these little fellows is due to the removal of insecticide during the carpet manufacturing stages. The effluent from this process was very harmful to the environment and costly to treat. Carpet Moths can be persistent household pests and we strongly recommend a continual prevention regime. 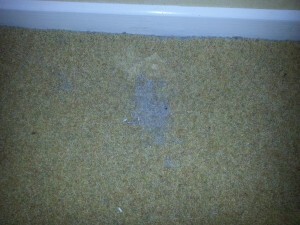 Warmer weather combined with centrally heated homes has led to carpet moth infestations becoming a year-round problem. The larvae cause the damage and carry on eating woollen and other natural fibres all year round. The adult moths are relatively harmless, other than their ability to increase the population of carpet moths dramatically if left unchecked! When moving this cabinet from the corner of the room, the sign that carpet moth was around were pretty clear. Preventative measures include moving furniture regularly when vacuuming, checking around the edges of the carpet and in dark areas for eggs or larva. If you do find any evidence of infestation in one room, change the bag or empty your vacuum cleaner before moving to another room as the eggs could be transferred to other rooms via your vacuum. Professional treatment is always advised to treat any form of insect infestation, however it is important to understand any treatment will only break the current lifecycle but it may not prevent it returning in the future. 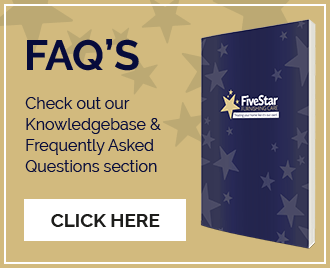 Free advice is always available from us by calling 01462 811210 anytime. 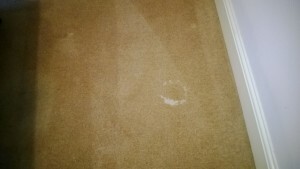 « Why should I get my carpets professionally cleaned?